The ancient King-seat of Dunadd, capital of the kingdom of Daldriada (Dal Riata), rises out of the barren flatness of Crinan Moss, the raised bog floodplain of the meandering river Add. This rocky outcrop was the power base of the Scotti tribe, who invaded from Ireland in the 8th century AD.The tribe were eventually to give Scotland its name. I wrote this tune while I was nursing a new harp made by Larry Fisher of Winnipeg, for Grainne Hamby. It had been shipped to me in Asheville, NC, and I had the job of harp-sitting and tuning it for a month. This tune was written to celebrate the many trips I have made from Scotland to Donegal, Ireland, and to mark the strong ties between Donegal and Glasgow in particular. These two tunes come from my days with the band Ossian. The first is a French traditional melody and the second is from Cape Breton Island. This tune was composed by William Marshall (1748-1833) who was born in the village of Fochabers in Moray and is one of Scotland's most famous fiddle composers. I wrote this tune to celebrate the arrival of Alma, who is the Goddaughter of my daughter Maggie, I was inspired by watching a hummingbird flitting about the place. Falkland has been a royal palace since the days of the Stewarts. King James II adopted it as a royal home (it had earlier been a castle of the MacDuff family). King James IV completed the main structure and King James V also added to the buildings there transforming it into a sophisticated Renaissance palace. James V died at Falkland Palace on December 14, 1542. His daughter, Mary Queen of Scots was a frequent visitor. This march was written by Dan McRae who was a piper in the Camerons during the siege of Monte Cassino in 1944, when during the four battles of Monte Cassino (January-May 1944), the Abbey buliding was pulverized in a series of heavy air-raids. A.A. Cameron's Strathspey is followed by Harris Dance, which is found in the Patrick MacDonald collection of Highland Vocal Airs, 1784. Both these tunes are to be found in The Inverness Collection of Highland Music. The full title of the first is ''Original air to which the poems of Ossian were sung''. The Braes of Busbie is also played in Ireland as a reel in G major. I wrote this tune to mark the retirement of Doug Orr as president of Warren Wilson College near Asheville, North Carolina. I am grateful for the support and friendship of Doug and his wife Darcy over the years. 2007 marked the 400th anniversary of the Flight of the Earls, a pivotal moment in Irish history, marking the end of the Gaelic order. In September 1607, four years after the end of the Nine Years War, a group of Ireland's noble elite left their land and people to find refuge and seek assistance for their cause in Europe. 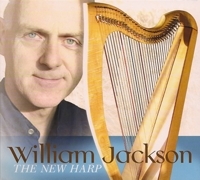 William Jackson plays a Jack Yule ''Raven '' Harp, a Larry Fisher ''Scotia'', and a wire-strung Harp made by Triplett Harps. William Jackson Plays: Scottish Harp, Wire Strung Harp, Whistle, Bouzouki. Tracks 4, 9, 11 and 12 recorded at Echo Mountain Studios, Asheville, North Carolina, Jan 2008. All other tracks recorded at Carlekemp Studios, North Berwick, Scotland. Engineered and mixed by Calum Malcolm, Jan 2008.